The Fed pricked the financial bubble yesterday as expected. Janet Yellen’s press conference couldn’t have been more perfect for our investment thesis at my new research publication, Stockman’s Bubble Finance Trader. It confirmed that the money printers have come to a stark dead end. 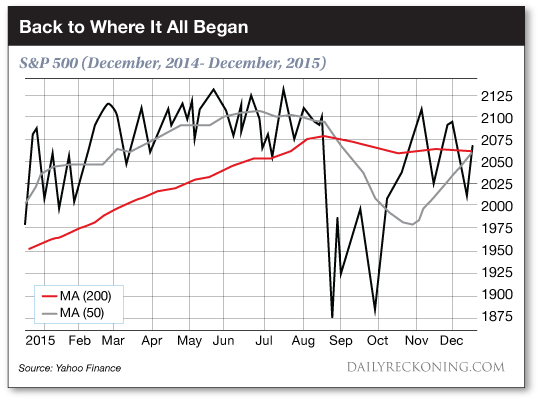 The fact is, the global economy is deflating rapidly and the U.S. is sliding into recession. But our Fed chairman is clueless about what’s happening. She and her posse of money printers are going to get bushwhacked by reality in the year ahead. She insisted repeatedly that the “economic fundamentals” are sound yesterday. Even though practically everything that matters is going south. This includes business investment, exports, retail sales, industrial production, inventory ratios, commodity prices, freight volumes and much more. Our Keynesian school marm hangs all of her groundless optimism on the completely misleading and heavily medicated jobs numbers put out by the Bureau of Labor Statistics. But here’s the thing: You can’t keep saying that the US labor market is in the pink of health when there are 102 million adult Americans without jobs. Or when there are still 3% fewer full-time, full-pay breadwinner jobs than there were 16 years ago when Bill Clinton was still in the White House. 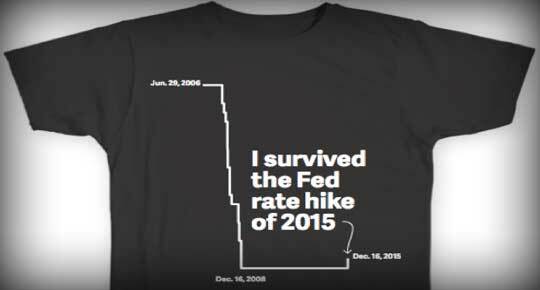 Yellen officially admitted that, after the lunacy of free money for 84 months running, the Fed is out of excuses. And that it will start draining up to $1 trillion per day from the Wall Street swamp of liquidity. If the Fed doesn’t follow through on this huge draining action, interest rates won’t go up, even by its trivial 25 basis points target. Its credibility would be shattered. But if it does start heavily draining liquidity, it will catalyze the current sell off in the massive $2.6 trillion high yield market. That in turn will pull the props out from under the stock market. Here’s why: massive debt financed stock buybacks and mergers and acquisition (M&A) deals have inflated equities to their current nosebleed heights. Beyond that, Yellen also admitted the Fed is out of dry powder when she stumbled and stammered on a question about the business cycle being long in the tooth. She was also reminded of the obvious fact that the Fed can’t slash interest rates in response to a recession, because it’s still effectively at the zero bound. If it is confronted with the recessionary forces and bursting bubbles that it absolutely does not see on the path ahead. As I warned earlier this week, the “market” staged a relief rally after the Fed’s announcement. But that was as phony as a $3 bill. It was just the work of the robo-machines and fast money traders trying to bang loose some buy orders above the 50-day and 200-day moving averages. Both are right in the 2070 range where the S&P 500 stalled out after the press conference ended. The S&P 500 has been chopping and turmoiling on the flat-line for a full year since it first hit yesterday’s closing price in early December 2014. It’s tried to rally 34 separate times since QE ended in October 2014, and has failed each time. Like Pavlov’s famous dogs, the market has been trained to buy-the-dips, and for years was handsomely rewarded. But that is no longer working. It’s only a matter of time before the buy-the-dips mantra morphs into “sell the dead cat bounce”. Like today’s action. In a selfish sense, these flagging efforts by the casino players to levitate another last gasp “rip” are welcome. They give you a chance to pick entry prices for our Bubble Finance Trader recommendations that offer even more upside when the inexorable bursting of the bubble fully incepts. They may even succeed in generating one last Santa Claus rally before next year’s recessionary forces spook the remaining gamblers out of the casino. Gamblers, we might add, who no longer have a friend at the Fed.